What you’ve watched in the last fortnight is the political equivalent of Heisenberg’s Uncertainty Principle in physics. That principle suggests that the closer you get to establishing the position of a particle the more difficult it is to work out its speed of movement. Conversely the closer you get to working out its speed of movement, the more difficult it is to work out its position. You will understand immediately that Heisenberg’s Uncertainty Principle applies perfectly to the SDLP. 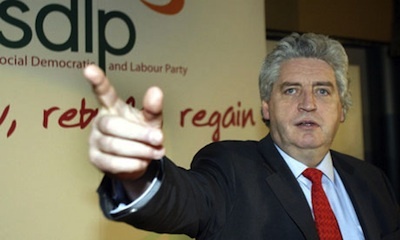 SDLP MLAs like particles also have movement: up and down, left and right hand spin as well as flavour. Some particles have charm which SDLP MLAs do not. What they all have in common is that as soon as you think you know where they are at a given moment, they’ve moved the next time you look. For anyone in doubt about the SDLP’s possession of these properties watch a replay of yet another incoherent Alasdair McDonnell interview on Sunday’s Politics Show. Regardless of all the weaving and dodging one position is now clear. The SDLP has now breached a fundamental element of the Good Friday Agreement which they negotiated. It’s this - ‘The governments continue to recognise the importance of measures to facilitate the reintegration of prisoners into the community by providing support both prior to and after release, including assistance directed towards availing of employment opportunities, re-training and/or re-skilling, and further education.’ Does the SDLP support that provision? If so, how does barring former prisoners from employment fit with that? Suppose next week Jim Allister, who at least is consistent in opposing all aspects of the agreement in whole and in part, brings in a bill to prevent former prisoners acting as drivers for ministers at Stormont? How will the SDLP vote? In what way would such a bill be different in principle from the one they’ve just allowed pass? Suppose he brings in a bill banning former prisoners from working in party offices in Stormont? How would that be different? All the same conditions apply. They haven’t been elected, have no mandate and are chosen because they’re party apparatchiks, just like bag carriers are in other parties. The SDLP fell into that old trap: hard cases make bad law. How many victims’ groups (and there are about 60) did they consult before they turned turtle last week? Or did they consult only one person? Did they base their capitulation on sentiment or political advantage? If they imagine the latter then they will get their come-uppance because it is glaringly obvious to everyone. If the former, then it’s no way to take decisions in politics. When did the newly found zeal for victims take hold? Last week? How come the SDLP, including Seamus Mallon and Brid Rodgers, had no difficulty cooperating with former IRA prisoners as special advisers for 15 years? In fact there were more of them five years ago. Why declare them anathema now? Here’s the worst of it. Everyone knows the SDLP would rather the act aimed at Sinn Fein employees (because they’re the only people who will be discriminated against) hadn’t gone through. They don’t agree with its aims or effects. They spoke against it. Everyone knows they wanted to vote against it. Criticising it but abstaining leaves them open to the charge of hypocrisy, which will be thrown at them because they did not have the courage of their convictions and those convictions are the belief enunciated by David Trimble, that just because a person has a past doesn’t mean they can’t have a future. After all both the first minister and deputy first minister have troubles-related convictions. Voters don’t mind. Furthermore, there’s no evidence that voters penalised anyone for appointing unelected former prisoners to important positions in the political system. What is instructive is that recent research by Professor John Brewer at QUB shows that the people most likely to be tolerant of ex-combatants and who oppose hardline policies for them are victims, both unionist and nationalist. As Brewer says “the real voices of victims are often drowned by the political rhetoric”. Unfortunately that’s what has happened in the last fortnight and the main culprit has been not Jim Allister but the SDLP.